Are you embarrassed with your smile because you have discolored teeth or old restorations? Are you unable to eat foods you enjoy because of the chipped or worn teeth? Then you are among the many adults who suffer from dental problems, often leading to pain and discomfort. CEREC® stands for Chairside Economical Restoration of Esthetic Ceramics. It is a revolutionary way to restore damaged teeth today. The benefits of CEREC® includes but not limited to the following. Single visit ceramic crowns, inlays, onlays and veneers. Since Dr. Zoe Huang, Dr. Zoryana Brodsky, Dr. Mandy Leung, Dr. Stephan Yoon and Dr. Filippo Cangini are able to design and fabricate the restoration immediately rather than sending off to a lab, patients usually do not need to wear temporaries and return for a second appointment. Metal-free dentistry. Tooth colored ceramic materials match the formation of the natural tooth structure more closely than amalgam, gold and other metal materials. Thus reduce the risk of cold hot sensitivity, tooth crack and possible damage to the nerve. Also, CEREC restorations are chemically bonded to your tooth, so Dr. Zoe Huang, Dr. Zoryana Brodsky, Dr. Mandy Leung, Dr. Stephan Yoon and Dr. Filippo Cangini can save as much healthy tooth as possible. The CEREC enamel-like material is biocompatible with the soft tissues in the mouth and provides a high-grade, antiabrasive and plaque-resistant finish. Perform and look like natural tooth. CEREC has been clinically proven in millions of successful restorations placed worldwide. With Cerec's natural results, your restorations will be virtually indistinguishable from your natural teeth. Here is one of the before and afters from Dr. James Klim, one of the leading dentist in CEREC esthetic restorations. 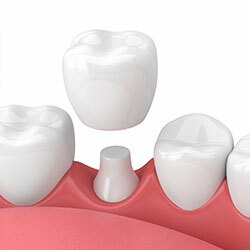 Step 1:Dr. Zoe Huang, Dr. Zoryana Brodsky, Dr. Mandy Leung, Dr. Stephan Yoon or Dr. Filippo Cangini will prepare your tooth for restoration, saving as much healthy tooth structure as they can. Step 2: Using a special digital camera, prepared teeth are digitally scanned and designed on the computer. Step 3: A ceramic block is used to mill out computer designed restoration. Step 4: The finished ceramic restoration is bonded to your tooth with precision fit.